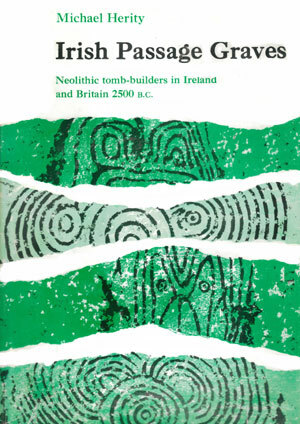 Irish Passage Graves: Neolithic tomb-builders in Ireland and Britain 2500 B.C by Michael Herity. Published in 1974 by Irish University Press, Dublin, Ireland. In 2,500 B.C. a Breton flotilla bore the builders of the passage graves into the Irish Sea. They had navigated from the Gulf of Morbihan and were first attracted by the island of Anglesey and by the Menai Straits, which reminded them of home. It was in the richer lands of Ireland, however, that they finally settled. In the Boyne Valley this dynamic society founded a thriving economy and, within a few generations, built three magnificent tombs, each covering more than an acre. During this time the Boyne Valley township housed several thousand people. Moving inland, they erected three hundred tombs, siting them on the summits of the highest hills. Today, these hilltop tumuli still strike the eye. Later generations arranged their cemeteries around the larger focal graves. They ornamented their monuments with an alphabet of magical symbols, combining them in abstract patterns 'to enhance the impact of the architecture, sometimes representing shadowy human figures, male and female — the gods and goddesses of death — in stylized icons. This book presents a description of the tombs, art, burials and grave-goods, and then attempts a reconstruction of the everyday life of their builders: subsistence, habitations, technology, even the industries of this remarkable people, the remains of whose civilization we call the Boyne Culture. Megalithic Tombs in Atlantic Europe and Ireland. History of the Study of Irish Passage Graves: Dublin Philosophical Society; Wright, Vallancey, Pownall; Beranger; Ordnance Survey; Synthesis 1870-1930; Ireland in the Atlantic Mainstream; 'The Boyne Culture'. The Boyne Valley. The Loughcrew Cemetery. Keshcorran and Carrowkeel. Knocknarea and Carrowmore. Leinster, Anglesey and North Munster. Movement into Ulster. New Grange Entrance Stone; Fourknocks I; Barclodiad Y Gawres and Dowth; Knowth and New Grange; Loughcrew and the North. Motifs and Meaning. Techniques. Rock Art. Foreign Analogies and Origins. Burial Rite. Stone Basins. Finds in the Burial Deposits: Pendants, Beads, Antler and Bone Pins, Stone and Chalk Balls. Absence of Flint and Stone from the Burial Deposits. Carrowkeel Ware. Secondary Finds. WAS THERE A BOYNE CULTURE? The Boyne Culture. Chronology. Neolithic A Farmers in Britain and Ireland. Passage Grave Settlement in Ireland. Passage Grave Habitations. Food Supply. Industries. Entrance Graves in Waterford. Achievement of the Boyne Culture: Technology and Economy; Society; Religion and Symbolic Culture. Tomb Structure. Origins and Implantation: Breton Tomb Plans, Grave-Furniture in the Morbihan, Iberia and Scandinavia, Golfe du Morbihan. The Establishment of the Boyne Culture. Published in 1974 by Irish University Press, Dublin, Ireland. Dr. Michael Herity is Lecturer in Celtic Archaeology at University College, Dublin. Before joining the college in 1961 he worked as a primary teacher and in Radio-Telefis Eireann. His research interests include the Irish Stone Age, prehistoric farming in Ireland and the history of Irish antiquarianism. Dr. Herity is Editor of the Journal of the Royal Society of Antiquaries of Ireland.